Paul BIya - A detailed biography of the President of Cameroon and wife Chantal. Paul Biya (born Paul Barthélemy Biya'a bi Mvondo) is the second (2) President of Cameroon, West Africa. Biya constitutionally succeeded President Ahmadou Babatoura Ahidjo, first (1) President of Cameroon. Biya's life story is one of determination, perseverance, dedication and hard-work. Biya's story shows how those with little to nothing can use education to transform their lives. President Paul Biya's vast education and diverse interaction with various groups and cultures in and out of Cameroon has enable him to master the art of diplomacy. The President's famous slogan for solving stressful problems during hard times being: "All can be peacefully resolved by Tactfulness and Methodology"
Biya was born on February 13, 1933 in the village of Mvomeka'a (Meyomessala) to Etienne Mvondo Assam and Mrs MVONDO (born Anastasie Eyenga Elle). Biya's parents had little to no wealth. As is the case with most Cameroonian children leaving home at very young age to get a good education, at age seven (7), Biya was sent to a Catholic mission in Ndem, some 30 miles from his home village, to acquire an education. Seemingly a gifted student, Biya's tutor (a French national) got him a sit in the then prestigious Akono Junior Seminaries. Through rigorous hard work and studies Biya made his way to the famous Lycee Leclerc in Yaounde, the Capital of Cameroon and then to the prestigious Sorbonne in France. President Biya has dedicated his life to public service of Cameroon being a civil servant and career politician. Biya made it through the ranks of Cameroonian bureaucracy serving as "Charge de mission" at the Presidency in 1962 to Prime Minster in 1975. On 6th November 1982 Paul Biya constitutionally succeeded President Ahmadou B. Ahidjo as President of Cameroon. 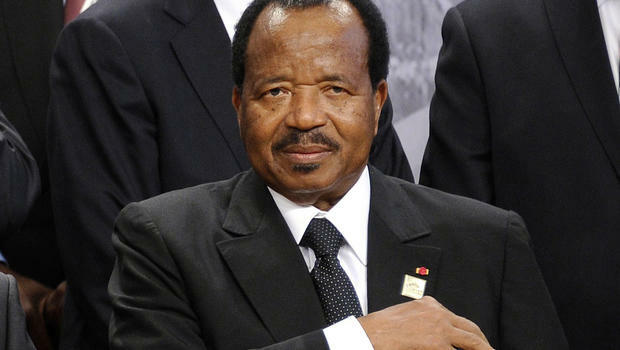 Presient Biya holds many distinguished academic honors and degrees. His famous publication is entitled "Communal Liberalism" published and translated in French, English, German and Hebrew. Paul Biya is world renowned for his diplomatic tactics and conflict resolutions. Besides handling and ruling over a 250 plus diverse ethnic group of Cameroonians in a relatively peaceful manner, Paul Biya's diplomatic tactics shone on the world stage with his role in the U.S led invasion of Iraq. Paul Biya married Chantal Biya on 23 April 1994, after the death of his first wife Jeanne-Irène Biya on 29 July 1992. He is a proud father of three children: FRANK Biya, Paul BIYA Junior and Anastasia Brenda BIYA EYENGA. i would like to have audience with a head of state of Cameroon, His Excellency Mr. Paul Biya. Please, how can I go about doing this? 1. ABILITY TO MAINTAIN IN POWER 2. ABILITY TO BE BLIND TO HIS PEOPLE CRY FOR CHANGE 3. DEMOCRACY IN CAMEROON, AND WILL TELL HIM TO RESIGN. Share your thoughts on President Paul Biya with us. What do you see as President Paul Biya's strongest leadership qualities? What do you think are his weaknesses? If you had a chance to be President Paul Biya's adviser, what would you like to discuss with the President of Cameroon, Africa?